When it comes to Samsung smartwatches, our Gear S2 review breaks new ground. Never before have we been able to describe a Samsung smartwatch as desirable, intuitive or – most importantly of all – compatible. With its Swatch-like looks and ability to play nicely with rival Android smartphones, Samsung has performed a spectacular U-turn. The result is a bold wearable that gets as much right as its predecessors got wrong. Read on to find out why Samsung is back in the game. It's impressive how many bases Samsung has covered in just two designs: the standard Gear S2 and the upscaled Gear S2 Classic. It should be noted that the stainless steel and plastic editions look like watches and feel well made – and if you've ever worn a previous Samsung smartwatch, you'll know that is big news. If we'd had a choice of which Gear S2 design we prefer, we'd have to pick the Classic. The ridged bezel, leather strap and smaller body combine for a premium feel, and it can be easily fitted with third party straps. And both are now the same price after receiving cuts due to the arrival of the Gear S3. One note to mention, though, is that we haven't had a chance to test the Gear S2 with 3G and GPS – the obvious choice to compare to the Sony SmartWatch 3 or Moto 360 Sport if you want a cheaper smartwatch for everyday use, as well as running or training. With two different designs and a bunch of different straps, there's some choice of style in the Samsung Gear S2 line-up, though it can't rival the likes of Apple for personalisation options. While the Gear S2 Classic, with its leather strap, looks more in line with a Fossil watch, the plastic strapped Gear S2 has more in common with a Swatch. This is key for a couple of reasons. 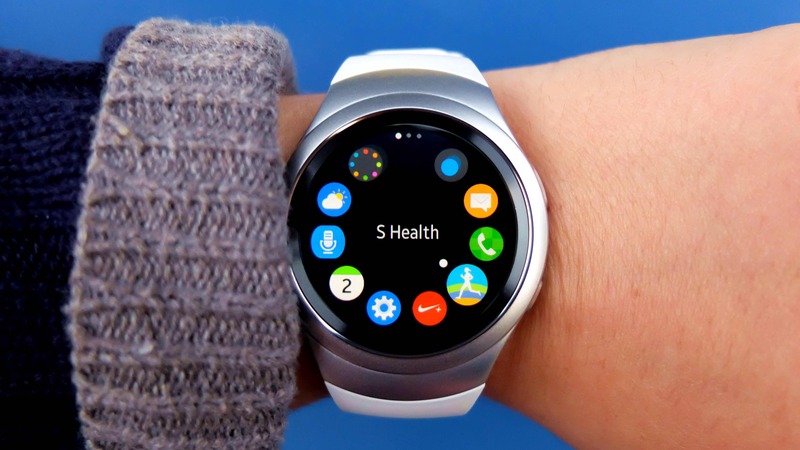 First, the Samsung Gear S2 doesn't try too hard. With its pre-loaded watch faces it looks fun and off-the-wall. It's not trying to be as classy as an Omega or as blingy as a Michael Kors. It has a confident style and it translates well. One of our only criticisms here is that the 11.4mm thick S2 is still quite chunky and sits quite high on the top of your wrist. This is similar to the second gen Motorola and if there's one guarantee about the next generation of devices it's that they will be slimmer, but right now smartwatches are still chunky. The Classic will work for women but it wouldn't be our first recommendation. Still, one thing is for sure – we are so far away from the first Gear watch. This is a polished, unisex, circular smartwatch that no one will be ashamed of wearing. The Gear S2's rotating bezel is far and away our favourite thing about the piece. Rather than try to disappear the bezel altogether like Motorola or primp it up to look like a traditional wristwatch like LG, Samsung has transformed it into a satisfying, addictive and most importantly, intuitive way of interacting with the smartwatch. When you move your hand to hover over the watch on your wrist it's the exact place your fingers land, even when you aren't looking down yet, and thanks to some clever UI design in its Tizen OS – more on that later – you can switch between apps, cycle back to notifications, change volume and brightness all in the same smooth motion. In short, it's genius and we're still yet to see any rivals take advantage of the same feature, despite Android Wear 2.0 possessing the power to make this happen. It's faster than Apple's Digital Crown on the Watch and the touchscreen prods and gestures of Android Wear. You can control everything with your finger on the right half of the bezel (if you're right handed) which means you will always be able to see the whole display. The bezel's closest rival here is actually a little known Chinese watch, designed by Frog design, called the Ticwatch which has a capacitive strip on the outer edge. There are also two buttons on the right-hand edge of the round watch body: 'back' at two o'clock and 'home' at four o'clock. The first of these is in the perfect position, the second can be a bit annoying to shift your hand around to press. You can set a double tap of the home button to launch an app, such as the music player or maps, which is handy, though unlike say, a Pebble, in order to select an app or setting it's back to prodding the touchscreen. With so much love for the rotating bezel you might forget to pay proper attention to the bright, vivid and sharp 1.2-inch Super AMOLED screen. It's smaller than some smartwatch screens and set into the watch so it doesn't look quite as modern as the Moto 360 2. But this just increases its retro/classic charm. At 360 x 360 pixels, the Gear S2's screen has an impressive pixel density of 302ppi, which means you can choose to set the font very small and see more messages or notifications on one screen as you scroll through them. It's as pin-sharp as the smaller Apple Watch and it shows. And unsurprisingly for a Samsung product, it can go very bright – probably too bright, though, as most days we settled for a low, easily readable setting. Tizen has always been a gamble for Samsung but this time it has paid off. Unlike all the Android Wear watches from Huawei and LG and Motorola which benefit from recent updates but can't really move the category on, the Gear S2 is doing its own thing. And its thing is a damn well easy to use smartwatch OS. As easy to use, in fact, as our beloved Pebble OS. The home screen is the watch face screen and you simply rotate left one click for recent notifications. Rotate right to get to a screen with an apps icon, settings, buddies (for quick messages) and S Voice. Keep rotating right and you can get easily glanceable information – weather, S Health progress, heart rate and information from third party apps. Choose the apps menu instead and Tizen makes the most of the circular screen and bezel with round app icons around the edge of the display to cycle through. Keep going with the bezel and it simply takes you to the next screen of apps. It is much quicker than zooming in and out with a Digital Crown. Notifications are there, messages are there, call logs, third party apps… You can't get lost. One niggle is that images, say from WhatsApp, don't display on the watch but this can be excused for the time being. Tizen performs well too with no lag between transitions – the only thing that keeps you waiting is animations when apps open. Unlike Android Wear, the music player controls work without fail every time. With alerts, the vibration is quite subtle – not refined subtle like Apple's Taptic Engine but more in a you-might-miss-it kind of way. You can set the Gear S2 to long vibrate and there are levels to choose from but even 'strong' isn't that strong. Our only criticism is that it would be great to be able to customise the aesthetic of the whole UI – it looks a little clownish and in particular will probably look a little odd on the Classic. Apple's watchOS 2 is colourful but looks more suited to a stylish accessory and watches such as the Olio Model One are offering bespoke watch faces and UIs custom to each finish. Like the Apple Watch, it's missing the contextual alerts of Google Now which can be really handy, but arguably what Tizen offers is – for now – more useful; a quick way to find out and access what's happening. What we really want is a blend of the two – Google's virtual assistant is the future but Android Wear is still a work in progress after 18 months. Outside of Apple and Google, Samsung has obviously been looking elsewhere for its services and maps are taken care of by HERE Maps. It's generally accurate and you can zoom in and out of your location using the bezel but it can be rather slow to load on the watch. Directions are handled by a separate HERE app, Navigator. Tizen supports Bluetooth – the S2 works with most Android phones, another first for a non-Wear Samsung smartwatch. It also has Wi-Fi on board – pull down to see if it's in 'standalone' mode or paired to a phone – as well as NFC for Samsung Pay, its mobile payment service which is a hit in Korea, just launched in the US and is coming to the UK. We'll update this review with our impressions of using Pay with the Gear S2 very soon. There is also the small matter of the 3G and GPS Gear S2 with a bigger battery but we haven't seen this model yet, and according to a Samsung exec it's not due to come to the UK or Europe. So many health and fitness features are bolted onto smartwatches these days, we'll focus on what Samsung does well. Step counting is accurate and S Health offers some easily glanceable graphics to show your progress to specific goals set in the smartphone app. If you want to be more active, the Gear S2 can vibrate to remind you you've been sitting down for nearly an hour and also give you the time you've been inactive as well as active – all useful, motivational stuff. Other alerts include step target achieved and healthy pace. You can also input that you've drank a glass of water or cup of coffee with one tap (once you've reached that screen with the bezel) which is exactly the kind of thing a smartwatch can help with. The S2 isn't going to replace your sports watch, especially as neither the regular nor Classic models have GPS, but there are some attempts to give you that option. It auto tracks walking, running and cycling, with estimates of calories burned, which is perfect for the kind of casual user who would consider the Gear S2 as an all-rounder. Though it did detect our evening jog, it also had a blip when it once – only once – classed sitting on the sofa as light activity. Nike+ Running is also preloaded and is a better choice for regular runners as it shows time, distance and pace right on the watch face. The heart rate monitor on the underside of the Gear S2 is a cut above too, and while it's no more accurate than the tech you'll find on an Android Wear watch, it's a lot more useful. It can take on the spot readings and can also be set to continuously take your pulse at intervals with two settings, moderate or frequent. When you're not exercising, you can also tag your bpm readings as 'resting', 'before exercise', 'after exercise' or with moods such as 'excited' and 'angry' so you can keep an eye on your heart's health. The app also lets you know if your resting heart rate is average or lower/higher than average, though the stats get annoying fairly quickly. Here's the part of the Tizen gamble that might not pay off. There are a handful of preloaded watch faces to choose from – both analogue and digital style, customisable and some with 'complications' to show the date, the weather or whatever you want instant access too. As for apps, Samsung promised over 1,000 Tizen apps designed for the Gear S2's circular screen and it gave developers plenty of notice to get them ready. What we have is a bunch of big names like Nike, CNN, Yelp and Twitter as well as some smart home control options, and then a lot of, shall we say, interesting apps to sift through. Interesting may be generous. You can head to the Samsung Gear Apps store via the Samsung Gear app to see the limited selection for yourself, but chances are you won't be too impressed. But this is Samsung and the Gear S2 has the potential to outsell all Android Wear watches. We haven't seen anything available for Tizen so far that pushes the boundaries of what smartwatches can be great at – we're thinking of standalone options that are genuinely useful. Things have improved since the early days of the app, but there's no hiding from the fact that Tizen's app support is the weakest of the proverbial 'Big 3'. The battery life on the Gear S2 is slightly above what you'd expect for smartwatches - it's still not going to blow you away, but also won't kill you within a day. Of course, this also depends how you use it – whether you go for the always on screen, how much you use apps like S Voice and Maps, etc. But when using the S2 as much as we've used Android Wear watches day to day, Samsung's smartwatch is the one left standing. The 300mAh battery inside is officially good for three days – we haven't got more than two and a bit days out of it, even without the screen 'always on', but we're sure it can go for longer with lighter use. To find out the battery level, you swipe down from the watch face, exactly the same as on Android Wear. Especially worth mentioning is the superb Power Saving mode. We left the house on 15% battery one morning having forgotten to dock the S2 in its tidy wireless charging dock overnight. We popped power saving on and it got us home from work before the Gear conked out. This switches the watch face to a simple grayscale screen, disables everything apart from alerts, calls and messages and turns off Wi-Fi. In short, it's wonderful and it means you won't be wearing a blank circle on your wrist on your commute home. As for that dock, it's the spitting image of the Moto 360 dock (a little smaller) and helps to build charging into your daily routine. The only annoyance comes with needing to charge your watch at work or when travelling, but nine times out of ten we prefer this kind of dock to a random proprietary cradle. Voice controls on the S2 are actually a bit of a letdown – it's one of the only areas Samsung needs to improve on. S Voice can be accessed on the first screen right of the watch face and it can also be set to open by double pressing the home button (as can any app). The software uses Nuance voice recognition tech, like Pebble watches, and this just isn't as reliable as Google Voice or Siri. The watch's mic picked up what I was saying without having to bring the device up to my mouth, choosing to open a result on my phone was quick and reliable and it's nice being able to add your own command phrase. I also recorded a voice memo with Samsung's built-in app which handily transcribed my mutterings. Annoyingly though, it was with only around 75% accuracy. It's much the same with voice searches, plus it's a bit of a pain that it defaults to Yahoo search results, rather than Google, on the watch. That can make for some odd results. As ever, voice needs to work more times than it doesn't in order to get people trusting the technology. It could have been a great anti-touchscreen one-two with the rotating bezel, but S Voice isn't quite there yet. Perhaps we'll see improvements with future devices taking advantage of Bixby. It's been a long time since the Gear S2 launched and marked Samsung's shift to its own Tizen platform, so we've decided to go back and live with the smartwatch to see how well it stacks up to its rivals 18 months on. However, unlike in the initial review above, we've been strapping the Gear S2 Classic onto our wrists, as opposed to its plastic twin. And while the latter is by no means provides an uncomfortable fit or ugly look, the leather strap gives the device a more classy feel. For our money, the overall design holds up well with the current crop of flagship devices, and many would prefer the smaller bezel over the hulking, rugged successor. If you're used to larger watches or you simply have a bigger wrist, it may take some time to the S2, but generally this is a neat and versatile look. We reckon it's a more reasonable size than the S3. Its small screen does have the potential to dampen notifications, but thankfully its brightness and sharpness are still up there with the best. When you compare it across the board, only really the Apple Watch Series 2 can leave it trailing behind. And while we're on the topic of hitting its strong points, it's worth noting that we still find getting around the device via the rotating bezel better than any others — it just works, and makes going back to other devices and swiping screens feel like a chore. Now, for the not so good. While the Gear S2 3G and GPS model dropped outside the US and Korea six months after the original variants, we've been testing the standard non-GPS model. With smartwatches adding an increasing amount of sensors since the S2's release, it's been left behind as a device for those in need of an exercise companion. When you get used to running with an in-built GPS in your watch, it's rough to go back to tethering. And as with any heart rate monitor from the wrist, it can suffer when playing at high intensity, despite offering helpful features to help you keep track of your long-term heart rate. The lack of support in terms of apps is also a big problem that Samsung has improved over time but ultimately failed to resolve. Strava is a perfect example of this; there's no native app available and only Android smartphone users are able to sync activity data from S Health. Overall, Samsung's Gear S2 is still a viable smartwatch for those looking to get in on the ground floor with a major player. There have been moves to add more apps and also cater for iOS users, but this still adds up to a slightly feature-dry package when compared to fresher devices. As easy to get on with as a Pebble, as stylish as an Apple Watch and with that tactile, rotating bezel as its secret weapon, the Gear S2 is the kind of smartwatch you’d kick yourself for leaving at home. It’s not perfect – this isn’t that dream hybrid of fitness tracker and all-round wrist computer, and the Tizen app store is a big miss – but by giving us decent battery life without sacrificing features it feels like a leap forward. The 3G and GPS model has the chance to change what an everyday smartwatch is capable of, but the regular S2 and the Classic should be on every Android owner’s smartwatch shortlist.